This music box have special significance. Some people say that the carousel is the testimony of two people who love. It is a game of love. As long as two people really love each other while sitting on the carousel, the carousel will carry them to a perfect paradise and their love will last forever. 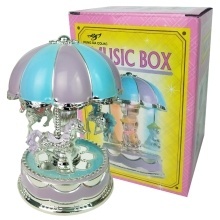 Do you like this carousel music box? If so, let it be your own or give it to someone you love. Perfect workmanship, unique castle of dome and smooth lines. Have LED light Gradient function and crisp and sweet sound. Perfect as romantic gift for Women Girlfriend on anniversary, birthday, wedding, Christmas or Valentine&apos;s Day. Romantic pink and blue 2 colors to choose.